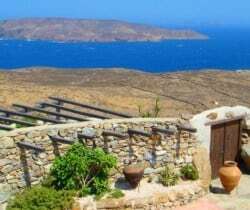 Come here to feel at one with the sea! 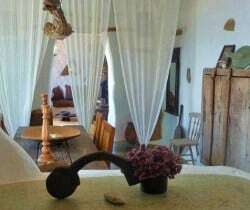 To soar and to whilst soaring above it! 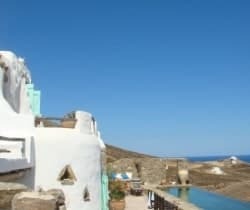 A super infinity pool is just one the delightful pleasures of this niche and luxury Mykonos villa, with a somewhat folkloric setting atop an arid and wild cliff above the Aegean Sea. 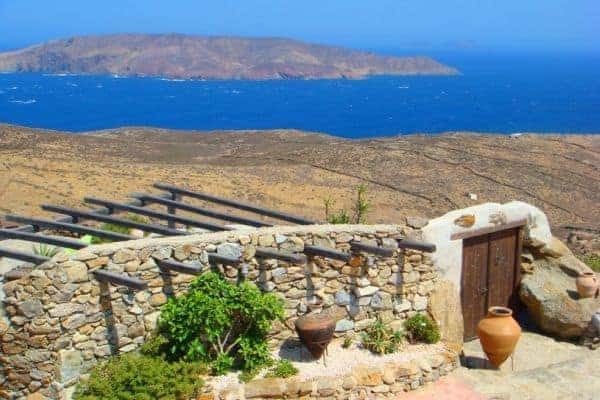 The quiet Tigani area is on the north east coast and far way from the crowds and the villa overlooks Lia Bay and its beautiful and secluded beach. 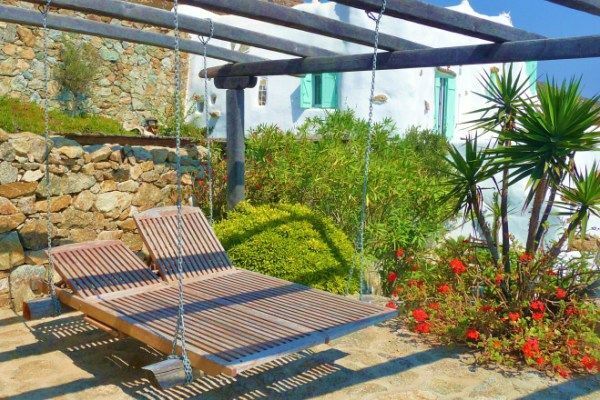 The property is not completely isolated (several houses are nearby) but is entirely private, with access via a private and gated road. 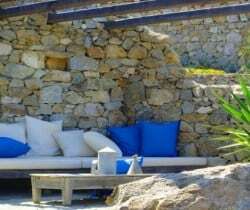 The villa is constructed to blend into the rocky topography of the hillside and is dressed by a traditional walled garden filled with olive trees, cacti and geraniums. 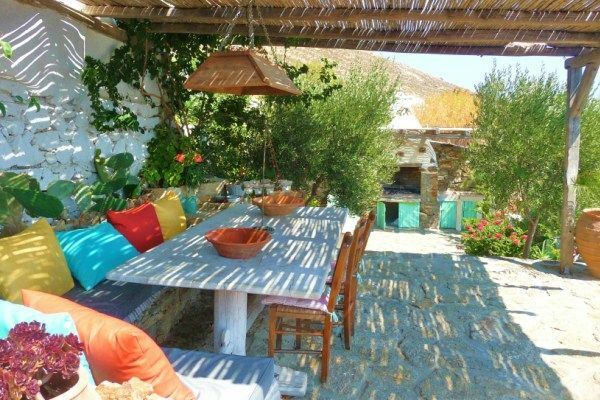 There is a sense of organic hedonism at this villa, with the furniture and much of the décor is assembled from sea parts. 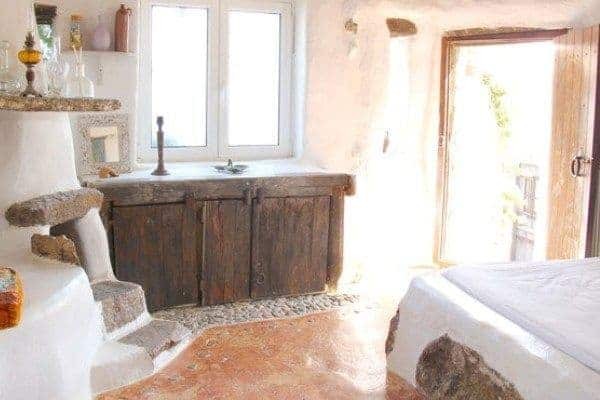 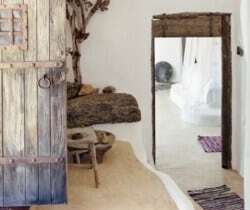 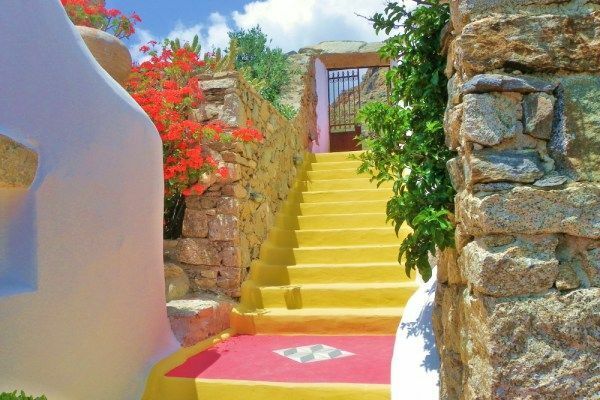 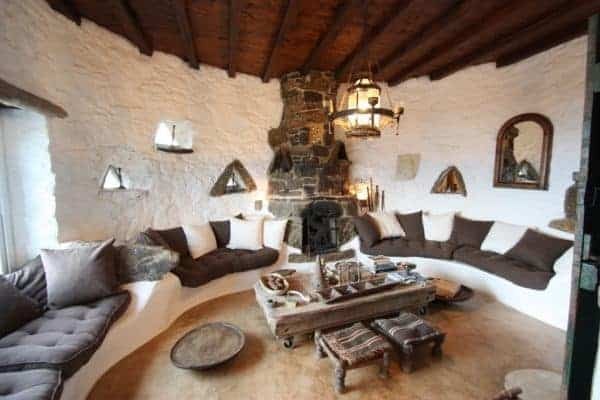 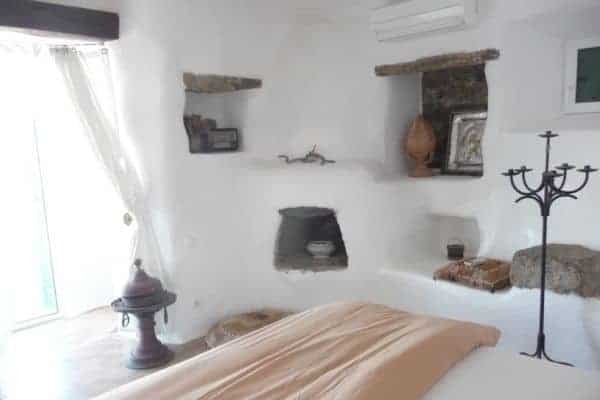 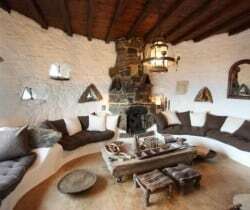 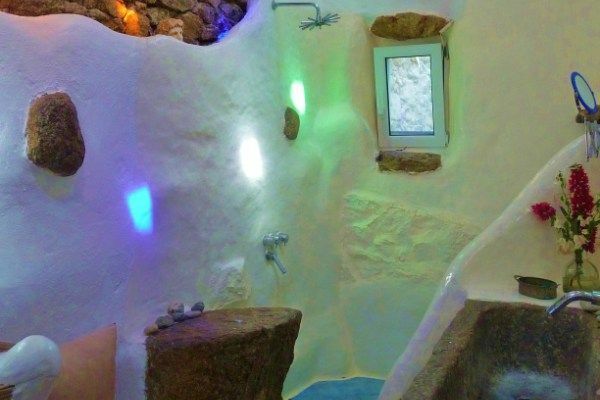 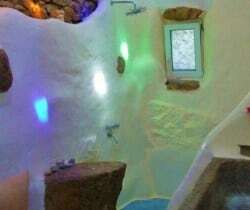 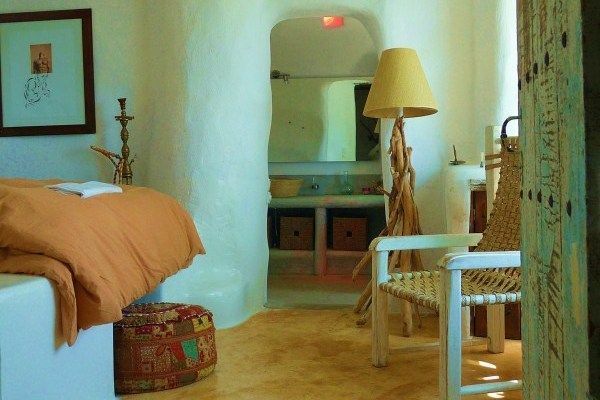 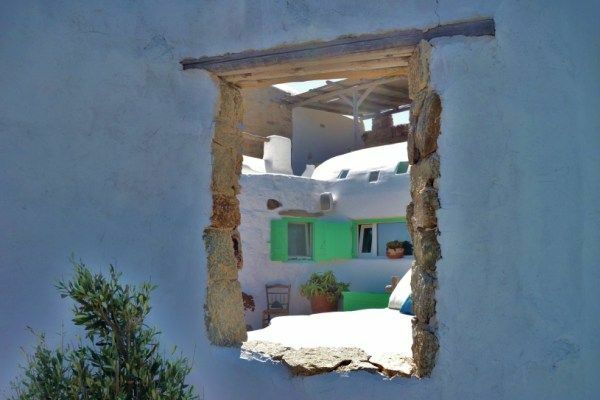 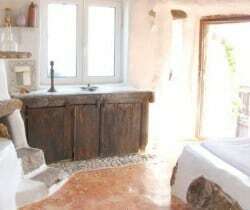 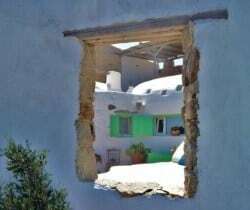 The villa is owned and was created by an artist, who literally sculpted and created a unique work of art by hand: one that features whitewashed walls and rock-carved corridors within a labyrinthine interior that has no straight walls and with very few corners! 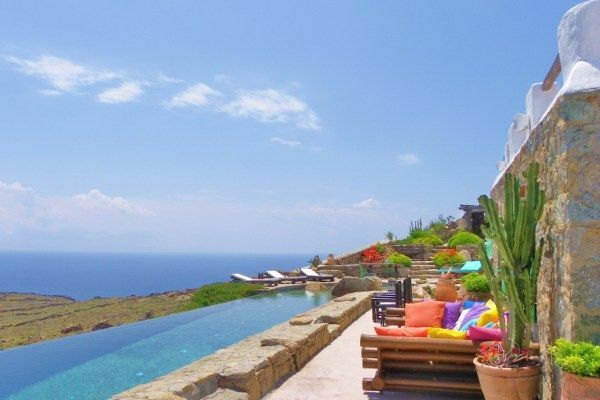 Not to be outdone in character, the outdoor terrace and the depth-descending infinity swimming pool run the entire length of the main house to present a sublime 180˚ sea vista (including the island of Dragonisi). 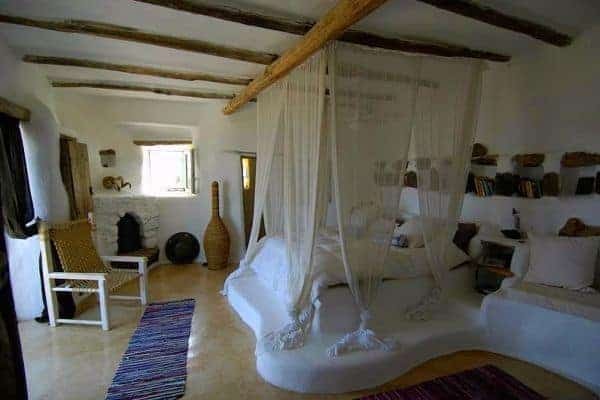 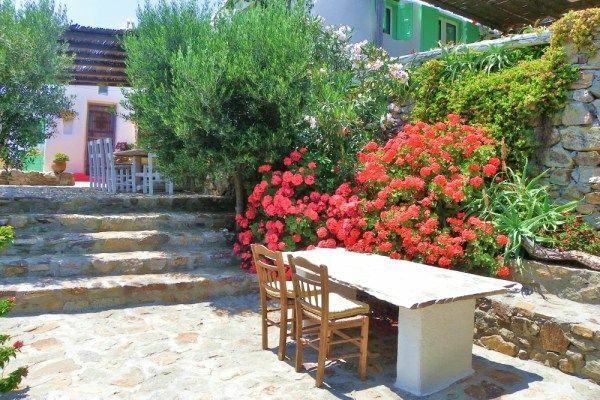 Arranged over two levels, with a mezzanine and an annex, this unique villa sleeps 8 in 4 bright, airy bedrooms en suite. 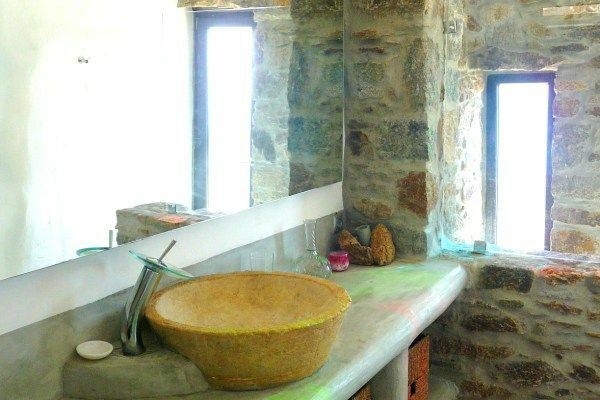 The chic first-floor master bedroom has a walk-in closet and a lovely domed-ceiling bathroom made of coloured glass, which creates spectacular optical effects. 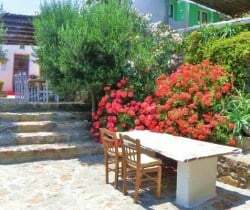 It also has a private balcony over the pool and which grants superb sea views. 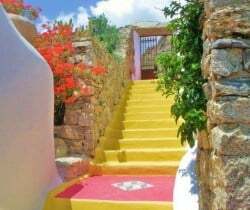 A staircase connecting the two levels resembles a natural rock cavity and the villa, overall, presents a suitably atmospheric and intimate ambience: one also quite magical and romantic! 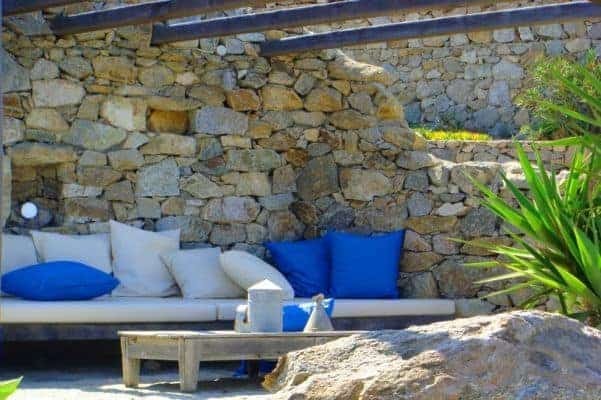 Guests may find the most strenuous thing to they may need to do is to decide when to get out of the pool or what to grill on the outdoor barbeque to eat in the shade of the terrace pergola, without having to sacrifice missing one second of the spectacular sea view. 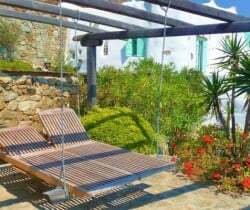 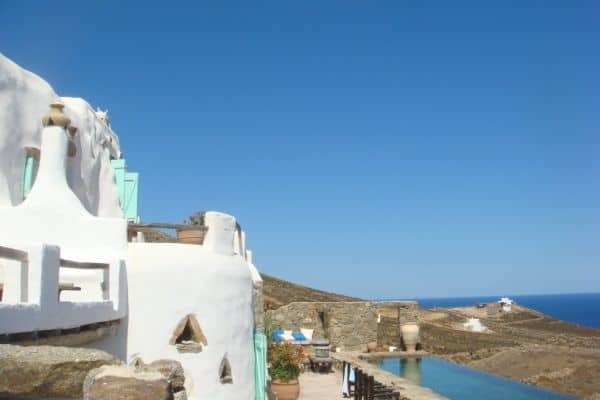 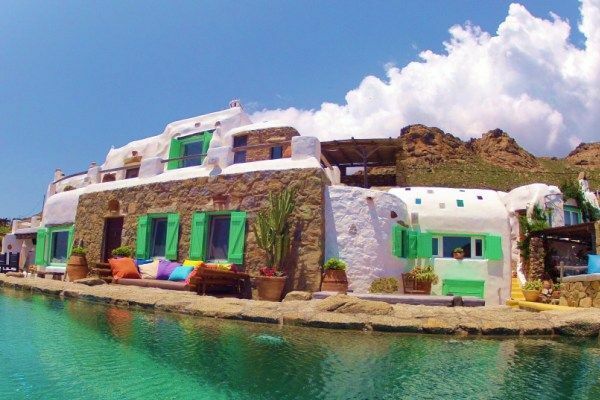 The luxury villa has an inspiring and surprisingly spiritual ambience, which is particularly well suited for anybody contemplating a more meditative holiday experience in Mykonos. 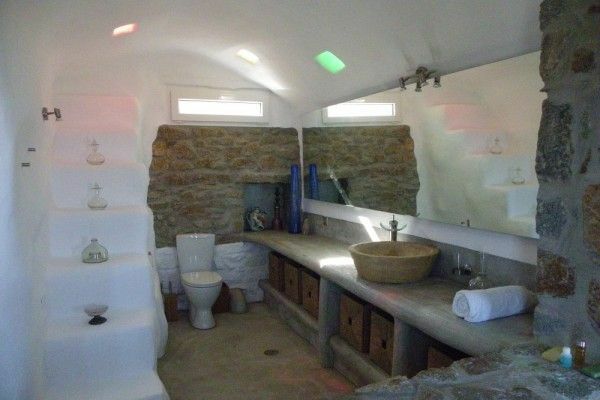 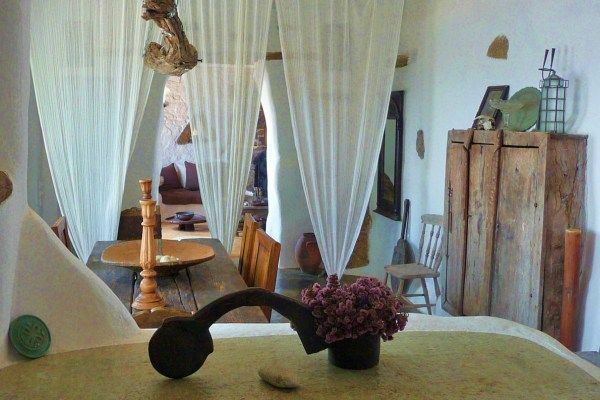 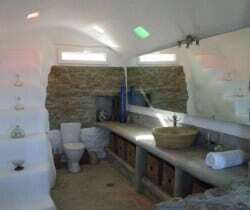 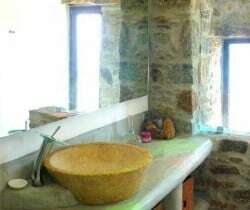 Its uniqueness also makes this unusual villa a rather special venue for honeymooners or groups of couples, though rather less so for young children and the more elderly due to the nature of its layout.